Modern Office Furniture Design From Top Italian Designers. Emotion is the key figure of our daily life. For those who think big, choose perfect design and love good taste we have created something truly news. It's our Office Furniture Design. Strong, elegant and unique italian design, sophisticated both in form and materials. Office Furniture Design is Italian Executive Office Furniture Collection focusing on delivering high quality inspiration. MOBILIARDI® offers an easy online solution for buying Contemporary Office Furniture. Our large selection of Design Office Furniture ensures that you will find exactly what you are looking for - at the right price. Below you will find Modern & Creative Executive Office Furniture Collection from the Top Designers. White Office Desk UNO designed by Karim Rashid. Black Office Dess UNO designed by Karim Rashid. 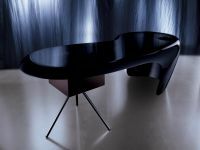 Design Furniture LUNA Pininfarina, black leather.